I participated in the PennApps hackathon in Philadelphia this weekend. While most of the city was struck with a bad snow storm, a group of hackers holed up inside the Penn engineering buildings to work on some cool hacks. My team consisting of three other hackers: Daniel, Alex and Madhur, decided to work on an app that could predict blood glucose levels of diabetes patients by building machine learning models. We have our own logo! We used the OneTouch Reveal API to gather some data provided by the Johnson & Johnson’s company. They are the manufacturers of OneTouch glucose monitors for diabetes patients. They also give their patients an app for tagging events like exercise (light, moderate, heavy etc. ), when they eat food and use insulin (different kinds – fast acting, before/after meals etc.). Our team thought that it might be a good idea to hack on this dataset to find out whether we could predict patients’ glucose levels without them having them to punch a hole in their fingers. A real world use case for this app would be to alert a patient when we predicted unusual glucose levels or have them do an actual blood test when the confidence on our predictions falls low. We observed mixed results for the patients in our dataset. We did reasonably well for those with more data, but others had very few data points to make good predictions. We also saw that our predictions became more precise as we considered more data. Another issue was that the OneTouch API did not give sufficient information about food and exercise events for any of the patients – mostly without additional event tagging. As a result, our models were not influenced much by them. The pink trend-line is our blood glucose predictions based on prior data. The shaded region indicates the prediction range. Whenever this region is broader, our confidence in prediction goes down. Update: We received the best student paper award for our paper at JURIX’15! In an earlier post, I talked about my work on Natural Language Processing in the clinical domain. The main idea behind the project is to enable domain experts to build machine learning models for analyzing text. We do this by designing usable tools for NLP without really having the need to send datasets to machine learning experts or understanding the inner working details of the algorithms. The post also features a demo video of the prototype tool that we have built. I was presenting this work at my program’s bi-weekly meetings where Jaromir, a fellow ISP graduate student, pointed out that such an approach could be useful for his work as well. Jaromir also holds a degree in Law and works on building AI systems for legal applications. As a result, we ended up collaborating on a project on using the approach for statutory analysis. While, the main topic of discussion in the project is on the framework in which a human experts cooperate with a machine learning text classification algorithm, we also ended up augmenting our approach with a new way of capturing and re-using knowledge. In our tool datasets and models are treated separately and our not tied together. So, if you were building a classification model for say statutes from the state of Alaska, when you need to analyze laws from Kansas you need not start from scratch. This allows us to be in a better starting place in terms of all the performance measures and build a model using fewer training examples. The results of the cold start (Kansas) and the knowledge re-use (Alaska) experiment. In the Figure KS stands for Kansas, AK for Alaska, P for precision, R for recall, F1 for F1 measure, and ROC with a number for an ROC curve of the ML classifier trained on the specified number of documents. We will be presenting this work at JURIX’15 during the 28th year of the conference focusing on legal information systems. Previously, we had presented portions of this work at the AMIA Summit on Clinical Research Informatics and at the ACM IUI Workshop on Visual Text Analytics. Jaromír Šavelka, Gaurav Trivedi, and Kevin Ashley. 2015. Applying an Interactive Machine Learning Approach to Statutory Analysis. In Proceedings of the 28th International Conference on Legal Knowledge and Information Systems (JURIX ’15). Braga, Portugal. [PDF] – Awarded the Best Student Paper (Top 0.01%). Update: This post now has a Part 2. And then there is a scope for allowing humans to interactively edit compositions at places where AI goes wrong. You could also use the samples generated by it as an infinite source of inspiration. Finally, here’s a link to the work in progress playlist of the rhythms I have sampled till now. Avinash Sastry (2011), N-gram modeling of tabla sequences using variable-length hidden Markov models for improvisation and composition. Available: https://smartech.gatech.edu/bitstream/handle/1853/42792/sastry_avinash_201112_mast.pdf?sequence=1. This week I did a 335 mi (540 km) bicycle tour from Pittsburgh to Washington DC along with a group of 3 other folks from the school. This is the longest I have ever biked and covered the distance over a period of 5 days. 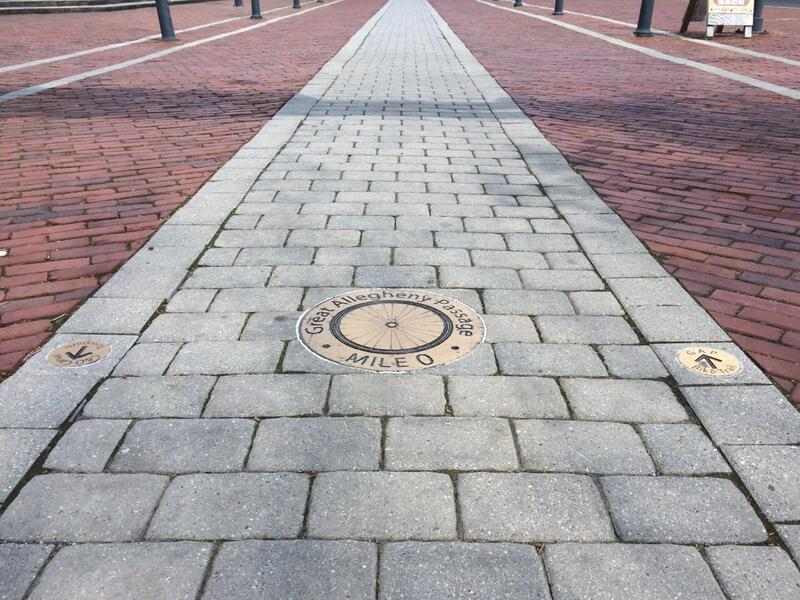 The entire trip is divided into two trails – the 150 mile Great Allegheny Passage from Pittsburgh to Cumberland, followed by the 185.5 mile long Chesapeake and Ohio Canal (C&O Canal) Towpath. Mile 0 of the GAP trail. The C&O trail begins from here onwards. If there’s one change I could make in this schedule, it would be to avoid staying over at Harpers Ferry which involved climbing a foot bridge without any ramp for the bikes. It is even more difficult if you are carrying a lot of weight on your bike racks. On the positive side, it allowed us to experience the main streets of Harpers Ferry which is rightly called “a place in time”. Another tip that you could use is to take the Western Maryland Trail near Hancock. It runs parallel to the route and is a paved one, which provides a welcome break after long hours of riding on the C&O trail. There are lots of campsites near the trail. There are hiker-biker camps near most major towns on the C&O trail and are free to use. We also camped at commercial campgrounds, like at the Trail Inn Campground in Frostburg, where we could use a shower. You can also get your laundry done at these places and save some luggage space. For food and drinks – I suggest that you follow the general long distance biking guidelines about eating at regular intervals while on the bike. I also strongly recommend using a hydration backpack though it adds to the weight you have carry on your shoulders. 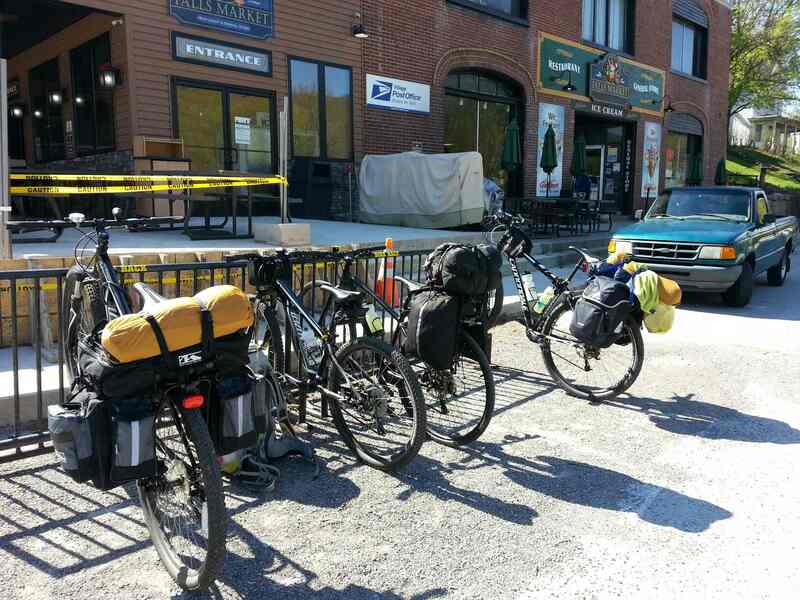 Here’s a picture of our bikes with our panniers and the camping equipment. I used a hybrid bike – Raleigh Misceo and was very comfortable riding it through all parts of the trail. I was expecting a couple of flat tires specially on the C&O sections with loose gravel and other debris on the trail, but didn’t face any problems. As long as you are not using a road bike with narrow tires you should be good on these trails. Finally for getting back to Pittsburgh we rented a minivan and put our bikes in the trunk which had ample space for 4 bikes with their front wheels taken off. If you decide to take this tour in future, we have plenty of online guides available for each of the GAP and C&O Canal trails. For a paper-based guide, I would recommend buying the Trailbook published by the Allegheny Trail Alliance. We also created a small webapp called the GAP Map that helped us plan our trip and prepare a schedule. Bike path along the C&O Canal. It also has several lock houses (not pictured) along the way which have now been renovated and can be used for overnight stay. View of the Monongehala river from one of the bridges on the GAP trail near Duquesne Rd in Pittsburgh. A section of the C&O Canal that once ferried goods between Washington DC and Cumberland. Along the trail near Cumberland. Elevation Chart marking the good news for us! A bridge along the trail near Ohiopyle. A short stop near McKeesport.